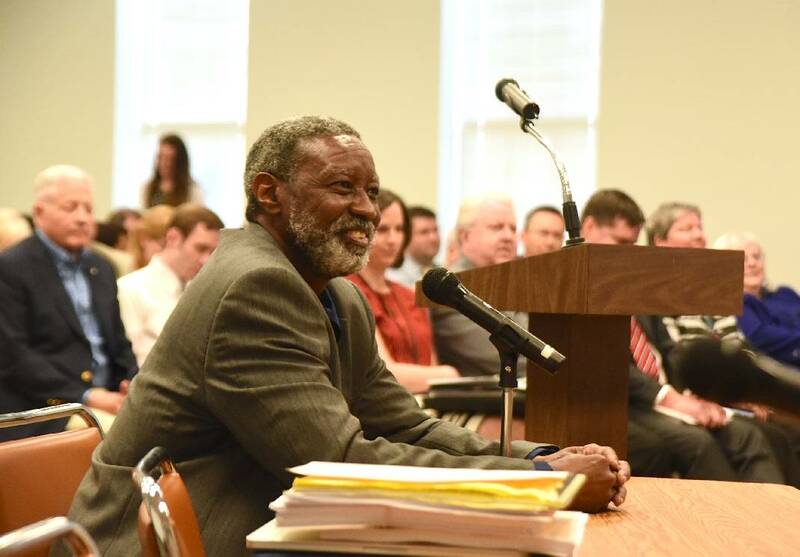 The Hamilton County Board of Education voted to name Kirk Kelly interim superintendent Thursday, April 21, 2016 at the Hamilton County School Board building. School board member Joe Galloway, right, speaks during a meeting of the Hamilton County Board of Education to name an interim superintendent Thursday, April 21, 2016 at the Hamilton County School Board building. The new interim superintendent of Hamilton County Schools is no stranger to the district. The school board voted Thursday night to place Kirk Kelly at the helm. Kelly has been in the district for decades and previously served as assistant superintendent of testing and accountability before being named acting co-superintendent when former Superintendent Rick Smith resigned March 14. School board members Steve Highlander, Joe Galloway, George Ricks, Karitsa Mosley and David Testerman voted for Kelly after interviewing three candidates for about 30 minutes each. Galloway said each candidate had strengths, but said Kelly is the best person to lead the district at this time. "Every question we asked Dr. Kelly, he not only answered in specifics, but he's already started acting on some of them," Galloway said. "He knows what we're dealing with right now." Highlander agreed, saying the district needs someone who can immediately jump into the job. But other members of the board wanted to see a change and someone from outside the central office fill the position. School board members Jonathan Welch and Donna Horn voted for Jill Levine, principal at Normal Park Museum Magnet School, to be named interim, and Rhonda Thurman and Greg Martin cast votes for Shaun Sadler, a retired Marine commanding officer. Welch reminded the board that its goal is to make the school system better. "Common is easy and common is the enemy of excellence," Welch said. He called the search for an interim superintendent a good exercise for the board as they begin looking for a long-term leader. "I don't know what the future holds, but I don't think anyone would say we are where we want to be," Welch said. "The community wants change, and the opportunity might come again before people start to leave." Thurman and Martin said they thought the district needed someone far removed from Hamilton County, stating Sadler has the experience and leadership the district needs. "I think [Sadler] fears no one and he owes no one," Martin said. During his interview, Kelly echoed what the board has been saying for months about the need for a vocational track, and the importance of schools preparing students for college or career. Kelly emphasized the need for community support in education, and said his first priority upon taking the position will be to look at the school system's budget, which goes into effect July 1. Several board members applauded Kelly for his thorough communication with the school board during the past month. He said he plans for that to continue. 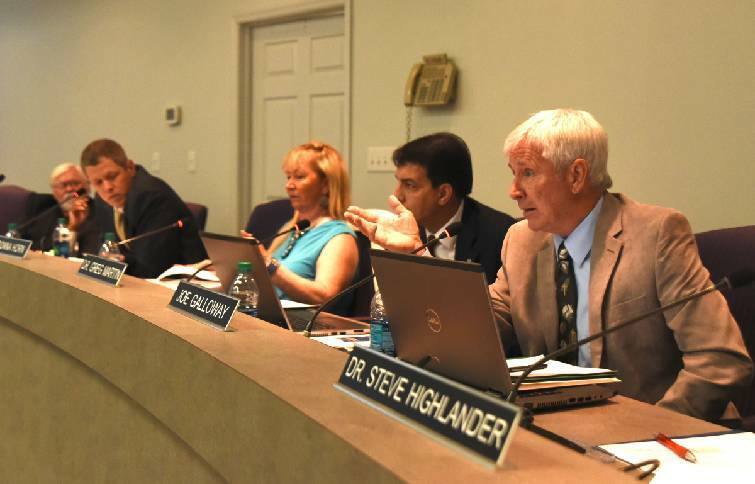 Following the interim superintendent decision, the school board and Kelly went into a private executive session with the board's attorney Scott Bennett and assistant superintendents Christy Jordan and Lee McDade. The board is allowed to discuss a limited number of things in these closed-door meetings — one being labor negotiations — which is what was discussed. Following the meeting, the board reconvened at the dais in front of a packed crowd to discuss its regularly scheduled agenda. The board unanimously voted to adopt a stricter and more lengthy bullying and harassment policy. Students with UnifiEd, a nonprofit organization dedicated to involving the community in public education, have been advocating for a change for months after finding that the school system's policy was not in compliance with state law. The board also voted to approve the individual school fees presented to the board, zoning changes and approved school leaders to present the proposed budget to the Hamilton County Commission. All three topics were debated during Thursday night's five-hour meeting, and the inequities among schools in the district were continually noted and challenged by board members. "We have to figure out how to integrate by income," Ricks said during the zoning discussion. "This is just not working." Mosley applauded the new budget, saying it's the first time in a long time that the budget is addressing the needs of the community — specifically increasing spending for vocational education. She brought up the recent wave of shootings in the city, saying something has to be done to give kids other options. "This is what we need so we don't keep losing children in the streets," Mosley said, shaking a copy of the budget in the air. "I don't care what side of the tracks you're from. We need to fix this." The school board also honored Brainerd High School's boys basketball team for making it to the state championship this spring. The team's coach, Levar Brown, applauded the boys' athletic and academic accomplishment — the team's average GPA is 3.4. "I don't feel like a coach. I look over there and see six, seven or eight of my sons," Brown said. Hamilton County's teachers of the year also were honored. Diane Huseman of Nolan Elementary, Carrie Bishop of Hixson Middle School and Kirsten Legac of East Hamilton Middle/High School were all named teachers of the year; and Shannon Seigle of the STEM School Chattanooga is Science Educator of the Year.